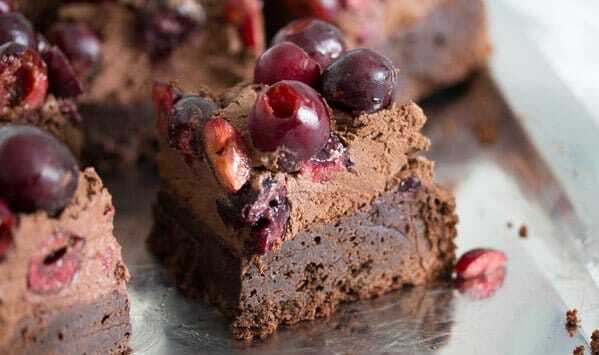 Chocolate brownies made with tons of chocolate and fresh cherries and topped with chocolate ganache. I have made many brownies during the last 10 years or so: Romanian Meringue Brownies, Cheese Cake Brownies, Vegan Brownies, Black Bean Brownies, Zucchini Brownies and so on, but I have never made any brownies containing 500 g/ 1.1 lbs chocolate. A chocolate madness, I am telling you. Chocolate in the brownies, chocolate on the brownies, and to add even more calories a whole pack of butter, 2 cups of double cream and lots of sugar. I have heard of a cake named Death by Chocolate before, but I have never made it myself. 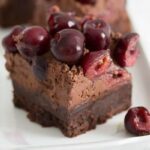 However, while making these unbelievable Chocolate Brownies with Fresh Cherries and Chocolate Ganache, that name – Death by Chocolate – kept coming into my mind. I found the recipe in a German recipe magazine (Lecker) two years ago. As cherries were not in season at the time, I made a mental note on making the cherry brownies the next summer. As “next summer” was last year, I did not have any luck at all, there was not one cherry to be found in our cherry tree. So, I put off making the brownies again. Until this summer, when the cherry tree was so full, that I was not even able to use up all those wonderful cherries. Many of them, especially those at the top of the tree, remained there for the birds and eventually went bad and fell to the ground. 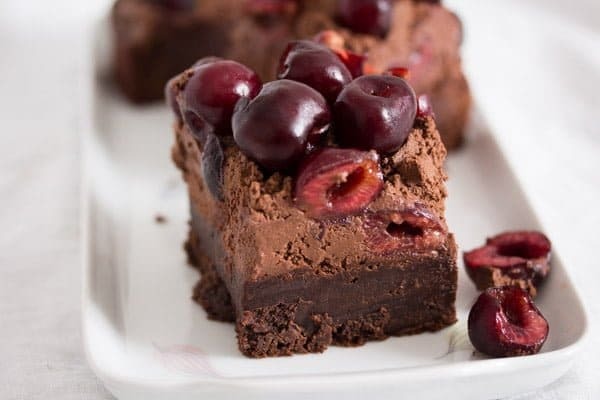 These Chocolate Brownies with Fresh Cherries and Chocolate Ganache are the last I have managed to make with the cherries this summer. Otherwise, if you still have too many cherries in your garden, have a look at this post on how to preserve cherries, for instance. Or at this recipe for cherry sauce. The recipe for the brownies is a pretty basic chocolate brownie recipe. I have made some often although, as mentioned above, I have never used as much chocolate for a cake as this time. When making the brownies you start by melting the chocolate into the butter. When you do that, make sure that the butter is not too hot and that the butter chocolate mixture doesn’t get too hot at any time. Melt the butter very slowly on very low heat and add the finely chopped chocolate. The finer you chop the chocolate, the quicker it will melt, and this way the mixture will not have the time to get too hot. You can use bittersweet chocolate chips, if you like, I didn’t because chocolate chips are not easily available here and when they are, they are much more expensive than plain chocolate. When working with so much chocolate, I always recommend using the best brand you can afford, the cake can only be as good as the chocolate is. And I also recommend using European style chocolate for this recipe, that is what I used and I have heard that American chocolate, for instance, tastes somehow different than European chocolate. I would normally think that the difference would not matter that much, but when using soooo much chocolate, I think that there might be a difference in the end after all. So for genuine results do use European style chocolate (German, Swiss, Belgian etc). Otherwise I cannot guarantee for the results, the taste really depends on how good the chocolate is. , I could not do without it anymore. Place a bowl over a pot of simmering water, making sure that the bowl doesn’t touch the water. Don’t let the water get too hot, it should not start to boil. Give the chopped chocolate to the bowl. Stir until almost all the chocolate melts. Remove the bowl from the pot and continue stirring until all the chocolate melts completely. Give the melted chocolate to another bowl and let cool slightly, while you do the rest. When stirring the whipped double cream into the chocolate mixture you have to work carefully but rather quickly. Fold only about ¼ of the whipped cream into the chocolate first, then quickly fold in the remaining whipped cream. 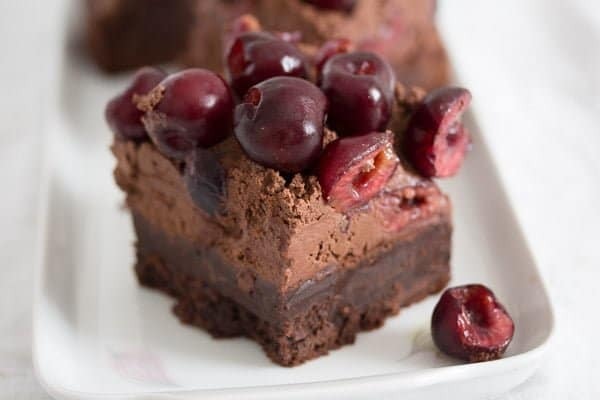 The original recipe recommends putting the frame of the loose bottom tin around the cake before topping it with the chocolate cream and the cherries. I did that, but I found it completely unnecessary, more of a disturbance than a necessity. You should do that if you notice that your chocolate cream mixture is too soft and threatens to leave the cake, my mixture was so stiff, it was absolutely pointless to frame the cake. First of all, I haven’t tried that, but as mentioned above I found this recipe in a recipe magazine. 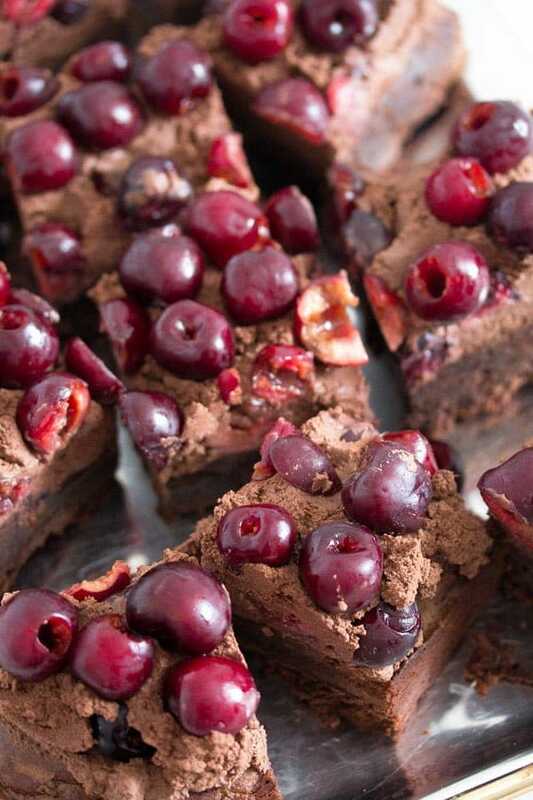 The magazine recommends making the cherry brownies with frozen cherries when cherries are not in season. To do that, defrost 650 g/ 1.4 lbs cherries in a sieve, so that they can drain well. Pat the defrosted cherries dry with kitchen paper and continue with the recipe. Preheat the oven to 180 degrees Celsius/ 360 degrees Fahrenheit. Grease a rectangular loose bottom tin (about 24x24 cm/ 9.4x9.4 inch) and line the bottom with baking paper. Another rectangular cake tin of similar size would be OK as well. Mix together the flour, cocoa powder and baking powder. Set aside. Cube the butter and give it to a saucepan. Let it melt slowly on very low heat. In the meantime chop the bittersweet chocolate. Give the chocolate to the melted butter and stir until the mixture is smooth. Don't let the mixture get too hot, remove it from the heat if it gets too hot. Give the eggs, sugar and salt to a bowl and mix with a hand mixer for about 5 minutes or until the mixture is thick. Immediately mix in the chocolate butter mixture. Add the flour mixture and mix only shortly, just enough to combine the ingredients. Pour the mixture into the prepared tin and level. Bake for about 25 minutes. The brownies should remain rather gooey in the middle and don't get too dry. Let cool completely in the pan. When ready to add the topping, place the cake on a rectangular platter. Wash and pit the cherries with a cherry pitter Westmark Cherry Stoner "Kernex"
Chop the chocolate and melt it on a double boiler or in bain marie. To do that place a bowl over a pot of simmering water, making sure that the bowl doesn't touch the water. Don't let the water get too hot, it should not start to boil. Give the chopped chocolate to the bowl. Stir until almost all the chocolate melts. Remove the bowl from the pot and continue stirring until all the chocolate melts completely. Give the melted chocolate to another bowl and let cool slightly, while you whip the double cream. Whip the double cream shortly. Add the cocoa powder and continue whipping the mixture until stiff. Carefully fold about ¼ of the whipped double cream into the chocolate mixture, then quickly fold in the remaining cream into the chocolate. Evenly spread about ¼ of the chocolate mixture over the cake. Give about ½ of the pitted cherries on the chocolate mixture. Top with the remaining chocolate mixture and the remaining cherries. 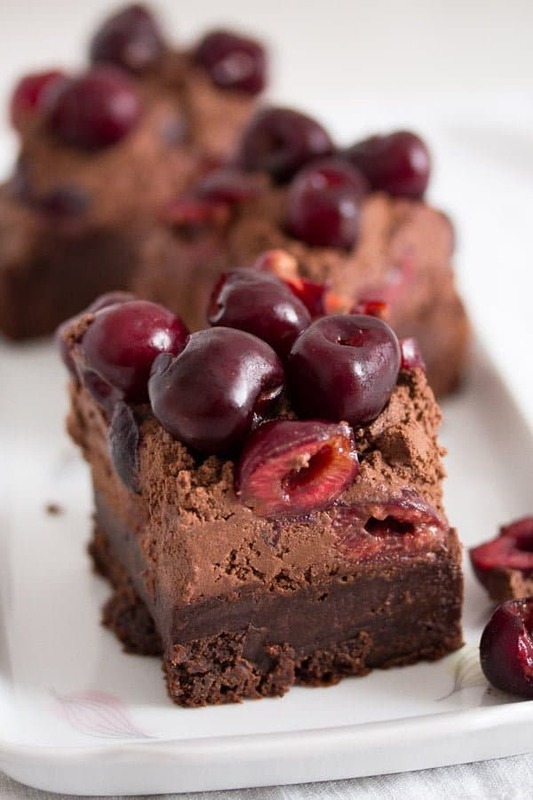 Place the cherry brownie into the refrigerator for about 2 hours or until set. Cut into about 25 pieces before serving. This looks heavenly! I have always love the combo of cherry and chocolate. Just a note – instead of the equivalent of Ban Marie ~ double boiler, the recipe says, in both the description and recipe, double broiler. This could be disastrous for some readers. how decadent! 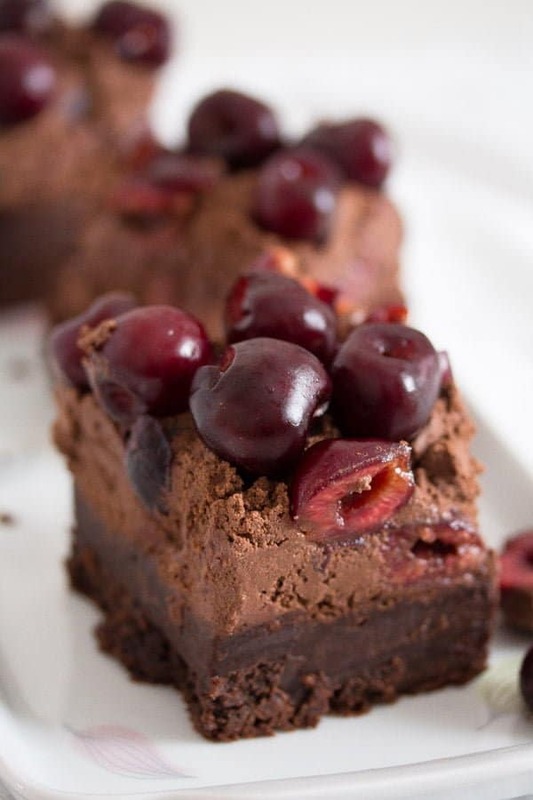 i love chocolate and cherries together!